FINALLY, a totally unique experience and answer to your event needs... and something to make ANY party or event truly memorable for all who attend. Just ShutterUP is not your grandfather's photo booth, it's today, it's hip and state of the art. Get in, get happy, and have your pictures in hand to enjoy in 20 seconds with a custom personalized image and message. Leave your guests smiling and carrying your brand or a unique memory. We’re FUN! Who doesn’t LOVE a photo booth? Well, Just ShutterUP is really DIFFERENT! It takes your event experience to a whole new level and your guests will LOVE it. 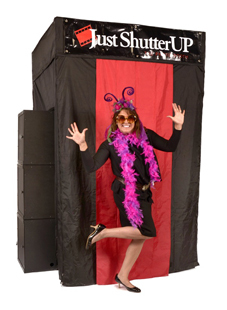 Who doesn’t just love a photo booth?